Another piece for conceptart.org's character of the week. A reworking of Hans Christian Anderson's 'The Little Mermaid'. this is very lovely. im putting it on my wish list. 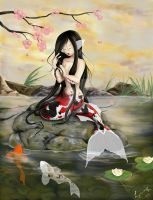 been hunting for something mermaid/aquatic to purchase and i would love to hang this in my home. excellent work! So which is reality, and which is an illusion, I wonder. AWESOME concept. This is fantastic! What's going on in this scene? This is very beautiful ! Great work. it is lovely for sure. I like how the reflection showing a different view "dreaming of being a mermaid" beautiful work rama! Beautiful work. Has a melancholic feel to it. It's truly lovely.